Prince Antoine Bibesco [1878-1951], Paris, London, Leningrad, and Strehaia, Romania. Claude Monet [1840-1926], Giverny. Paul Guillaume [1891-1934], Paris; sold May 1930 to Marie N. Harriman [1903-1970] and W. Averell Harriman [1891-1986], New York [Marie Harriman Gallery]; W. Averell Harriman Foundation, New York; gift 1972 to NGA. According to Harriman collection records in NGA curatorial files. Exhibition of Modern French Painting, The Detroit Institute of Arts, 1931, no. 14. Paul Cézanne: Exhibition of Paintings, Water-colors, Drawings and Prints, San Francisco Museum of Art, 1937, no. 33, repro. The Painters of Still Life, Wadsworth Atheneum, Hartford, 1938, no. 51, as The Table. Capolavori Impressionisti dei Musei Americani, Museo e Gallerie Nazionali di Capodimonte, Naples; Pinacoteca di Brera, Milan, 1986-1987, no. 8, repro. Impressionist and Post-Impressionist Masterpieces from the National Gallery of Art, Washington, State Hermitage Museum, Leningrad; State Pushkin Museum of Fine Arts, Moscow, 1986, no. 35, repro. Französische Impressionisten und ihre Wegbereiter aus der National Gallery of Art, Washington und dem Cincinnati Art Museum, Neue Pinakothek, Munich, 1990, no. 63, repro. From El Greco to Cézanne: Masterpieces of European Painting from the National Gallery of Art, Washington, and The Metroplitan Museum of Art, New York, National Gallery of Greece, Athens, 1992-1993, no. 64, repro. Cèzanne i blickpunkten, Nationalmuseum, Stockholm, 1997-1998, no. 24, repro. Classic Cézanne, Art Gallery of New South Wales, Sydney, 1998-1999, no. 10, repro. Ciarán Lennon: Hapax, An acrylic painting in four parts 2001, National Gallery of Ireland, Dublin, 2002, unnumbered catalogue, repro. Cézanne & Giacometti: Paths of Doubt, Louisiana Museum of Modern Art, Humlebaek, 2008, no. 52, repro. Cézanne. Paris-Provence, The National Art Center, Tokyo, 2012, no. 85, repro. Venturi, Lionello. Cezanne, son art, son oeuvre. 2 vols. Paris, 1936. Walker, John. National Gallery of Art, Washington. Rev. ed. New York, 1984: 499, no. 742, color repro. Französische Impressionisten und ihre Wegbereiter aus der National Gallery of Art, Washington und dem Cincinnati Art Museum, Exh. cat. Neue Pinakothek, Munich, 1990: no. 63, repro. Coman, Florence E. Joie de Vivre: French Paintings from the National Gallery of Art. Washington, 1991: no. 12, repro. Naubert-Riser, Constance. Cézanne. London, 1992, 120, repro. Rewald, John. 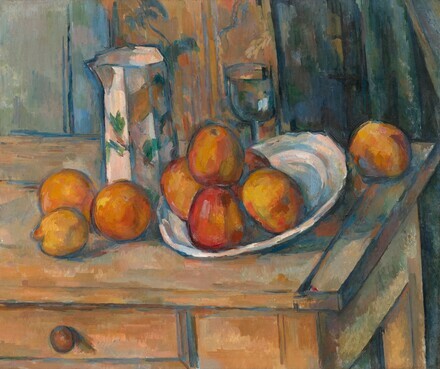 The Paintings of Paul Cézanne: a catalogue raisonné. 2 vols. New York, 1996:no. 849, repro.